A new-generation reference book about the building blocks of our world, for kids used to surfing and swiping. Small in size but big in personality, stars of movies, TV, and games, penguins are loved by kids everywhere. This book reveals their real lives, far beyond our wildest imagination! Meet every one of the 17 different kinds of penguin; discover how they eat, sleep, talk, walk, and swim, and of course, the wonderful stories of how they look after their eggs and chicks. Big and beautiful Antarctic images, especially shot for this book, are combined with up-to-the-minute information from penguin experts, and dramatic modern graphics to entice confident and reluctant readers alike. And there's lots to do! Be a marine biologist for a day, make and decorate a penguin egg, and track how the diminishing ice is threatening the lives of these fantastic creatures. 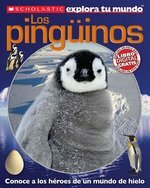 Pequenos, pero con una gran personalidad, los pinguinos son adorables. Este libro contiene todo lo que deseas saber sobre ellos. Con hermosas imagenes obtenidas especificamente para el mismo.